Do people really have a sense of unity anymore? There are so many people with awesome ideas. Even people who are quick to cosign on the ideas. Yet when it comes time for performing, you encounter an empty room. A friend of mine came up with this idea for an event. The person she talked to was all ecstatic about it, even saying she would sponsor it and the other members would chime in with promoting and advertising. However, after the initial idea was presented, the promotion of it was slim to none: to the point where I thought the whole shebang had been cancelled. The irony is a few days ago, the very person who talked about sponsoring the event sent an email saying everyone needs to "support each other more". Yet those very people are a no show at this event that could have raised sales and helped a cause. 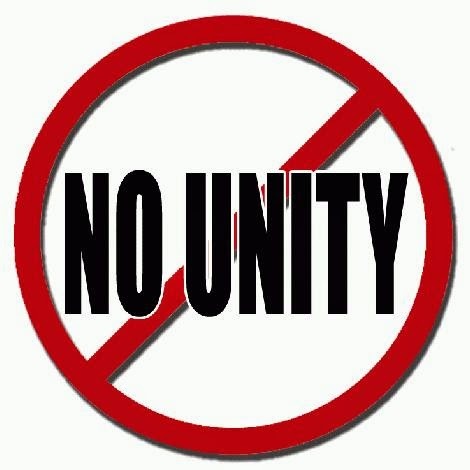 The point I'm getting is that one should just not talk about being unified but actually be unified. I don't understand either, yet, time and time again I've watched people standing apart due to petty beefs when they should be standing together strong. Together we can accomplish almost anything.